The Blue Hens fall to No. 1 North Dakota State. FARGO, N.D. — Playing as far from home Saturday as they ever have, Delaware looked lost in the early going against the country’s best team. The No. 1-ranked North Dakota State Bison, winners of six of the last seven FCS national championships, dominated both lines of scrimmage en route to a 38-10 victory against the Blue Hens. 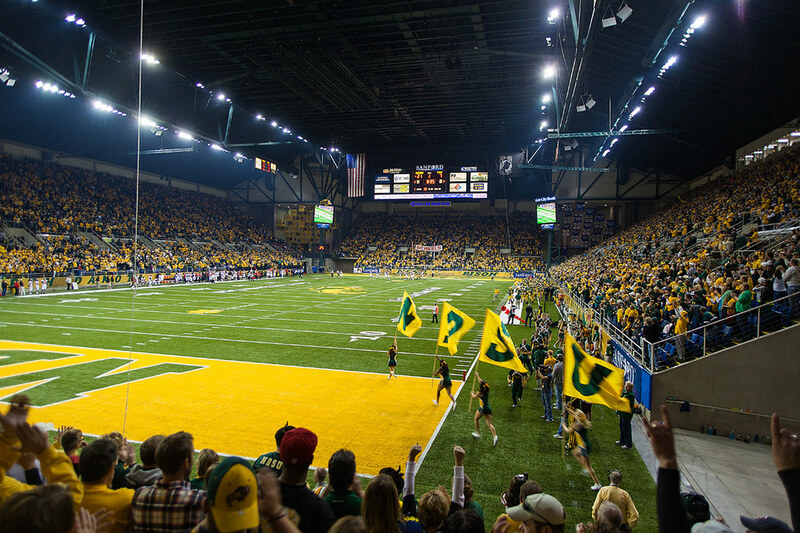 The raucous Bison crowd of nearly 19,000 inside the FargoDome in Fargo, N.D., made the upset bid even more difficult for the Blue Hens, in the first ever meeting between the two teams. The Bison jumped out to an early lead, scoring 28 points in the first quarter. Their first two scores came in the opening five minutes of play. The Bison ended their first drive — a 9-play, 75-yard procession — with an Easton Stick 2-yard touchdown run. On the ensuing drive, linebacker Jabril Cox intercepted Pat Kehoe’s first pass of the game and returned it for a touchdown. The interception was Kehoe’s first of the season. He threw three interceptions and lost a fumble in the fourth quarter. Delaware netted just 53 yards of offense in the first half and did not finish a possession in North Dakota State territory until their first drive of the fourth quarter. The Blue Hens passing attack, which had averaged 245 yards per game through the first three weeks of the season, was held to a pedestrian 95 yards. On the ground, Delaware gained just 57 yards on 26 attempts. “Going down 14-0 quick kind of forces you to play outside the scheme of what you normally do, trying to get back in the game and I think that kind of prohibited us from getting our running game going, which is so vital in our offense,” Kehoe said. North Dakota State too played out of character in the first half, though to much different results. North Dakota State typically operates a run-first system — the Bison entered the matchup averaging over 300 rushing yards per game and only 114 passing yards per game. Stick, a four-year starter at quarterback, came out firing and kept the Blue Hens off-balanced with a combination of play-action passes, boot legs and option runs. He completed 17 of 26 passes for 280 passing yards and two touchdowns, all in the first three quarters of action. He also ran in two touchdowns and gained 41 rushing yards. Delaware outscored North Dakota State 10-3 in the second half. Delaware’s lone touchdown came with 1:57 remaining in the fourth quarter when Malcolm Brown recovered a fumble near the goal line and returned it 92 yards for a touchdown. Delaware has an open date next week before returning to action on Saturday Oct. 6 at Richmond. Like a season ago, Delaware will enter the open date 2-2. “If there is any positive it’s that we’ve got the guys to still do something special,” Reeder said. “There’s no question about the 11-18 guys that we play in a game offensively and defensively. North Dakota State has won six of the last seven FCS national championships. In that time frame Delaware has failed to make the playoffs.